The question was sparked by my FB post of a magnetic pendulum fractal and the follow up messages of my PhD colleague Hung Keung who had been working with Chinese characters and calligraphy in his practice. 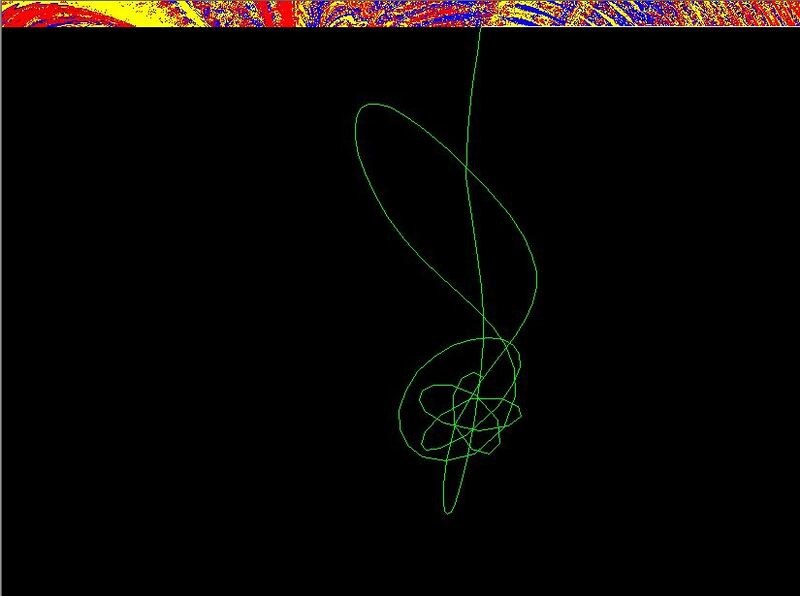 The way the above fractal images are created, is by tracing every possible starting position of the pendulum (the 2D image) and coloring the pixel based on the magnet that is nearest after some time (or when the pendulum stops moving). As mentioned before, the motion of the pendulum is highly chaotic – that is, one cannot predict the path or final resting spot in many cases – due to the nature of such a dynamic physical system. Calligraphy – in general terms – is the art of writing. Asian cultures have used this form of communication for centuries (書法 in Traditional Chinese, literally “the method or law of writing”) and many characters are quite artistic in nature. The idea is now, to apply a pendulum to calligraphy. 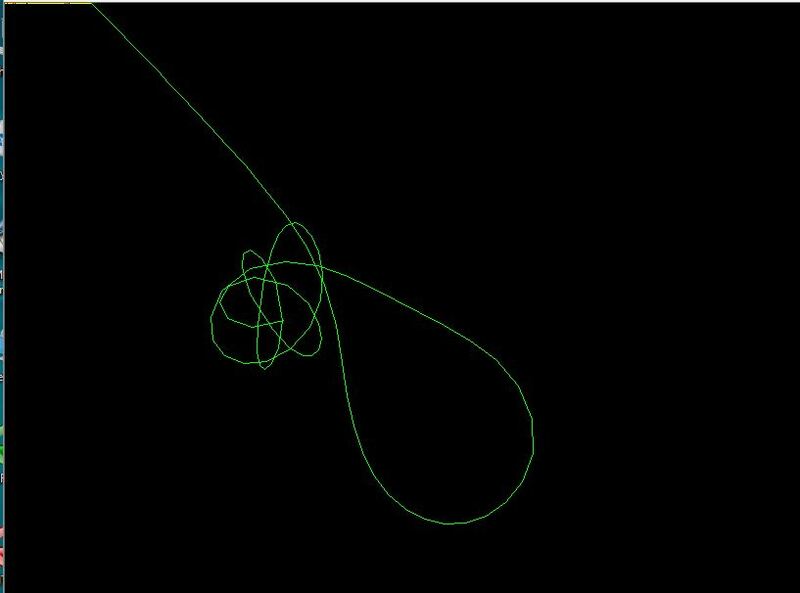 The goal is to build a system that acts like a magnetic pendulum system (physically or simulated), and has a mechanism that allows the pendulum to “draw” on demand – an artist controls the starting position of the pendulum and the time when things are being drawn. Magnetic pendulum calligraphy is thus the art of writing with a magnetic pendulum. 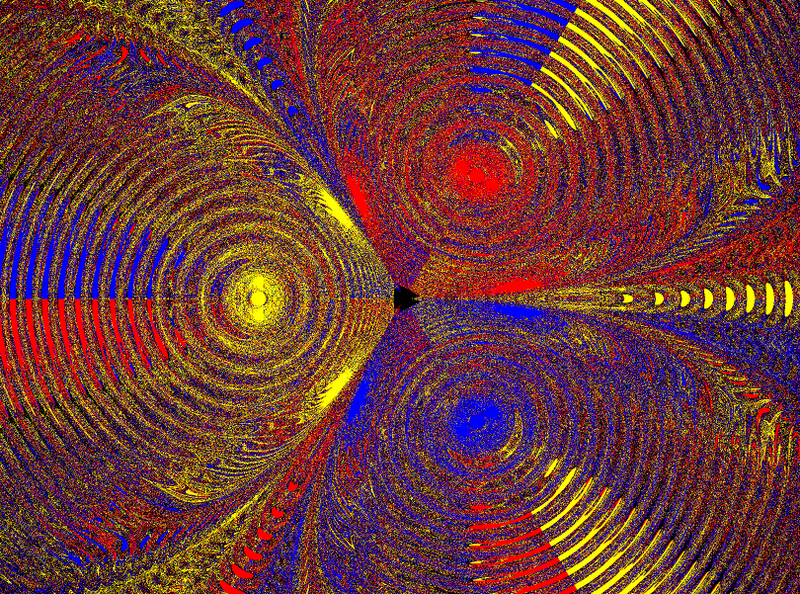 Creating a 2D simulation shouldn’t be too difficult either – the magnetic pendulum formula is published (i.e. 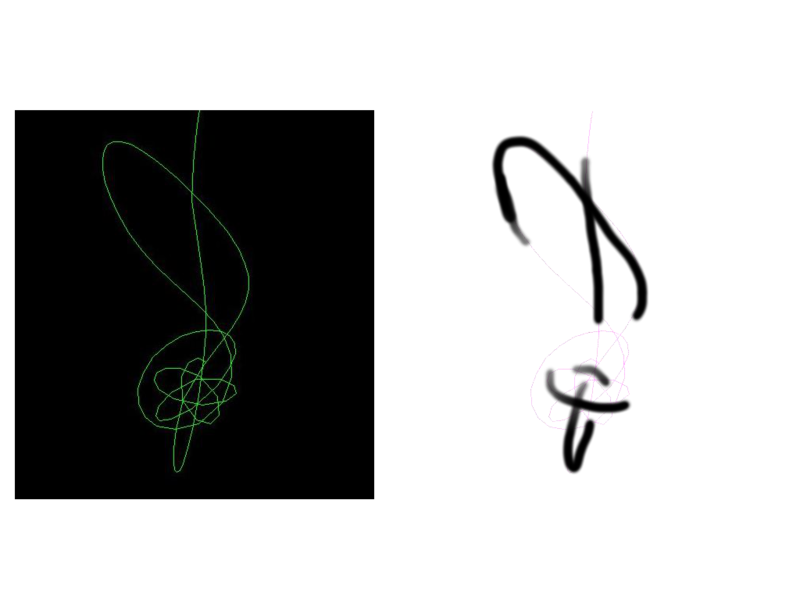 here http://www.codeproject.com/KB/recipes/MagneticPendulum.aspx?display=Print) and the simple “brush on canvas” processing can be triggered using a mouse-click. One could also make a full 3D simulation, but that would require much more work but could be a way to create this system for VR. However, the difference between a simulation and a real physical pendulum are very fundamental, and in my view reality wins. The tactile nature of a physical pendulum is not present in a simulation and very hard to model with current input devices, even in VR. A physical simulation that takes into account the influence of mechanical factors (hinges, friction, air) and the magnetic forces (non-uniform fields, magnet shapes) on the final motion is quite a challenge. To recreate the subtlety of the brush-sliding-over-paper-to-draw, all with stroke subtleties and friction influence on how much ink is deposited, is another difficult simulation problem. 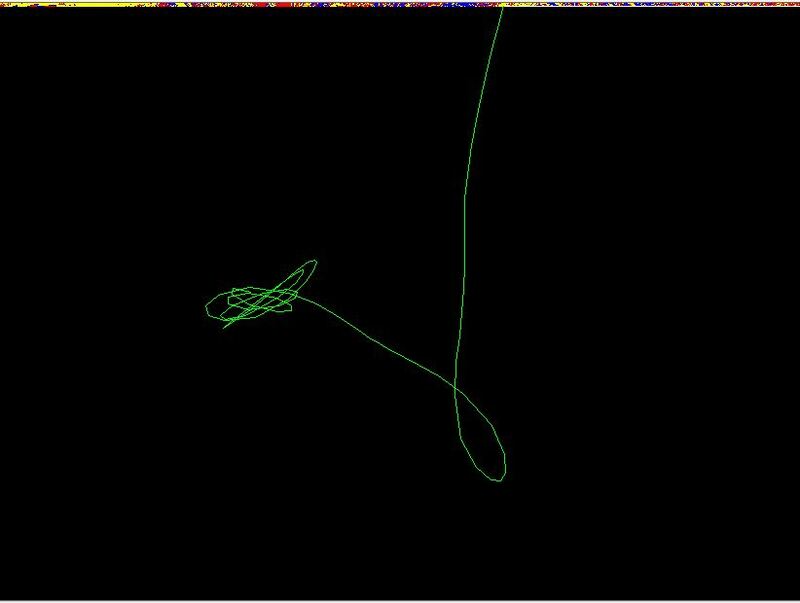 The performative nature of an artist writing “pendulum calligraphy” is mostly lost in a simulation. 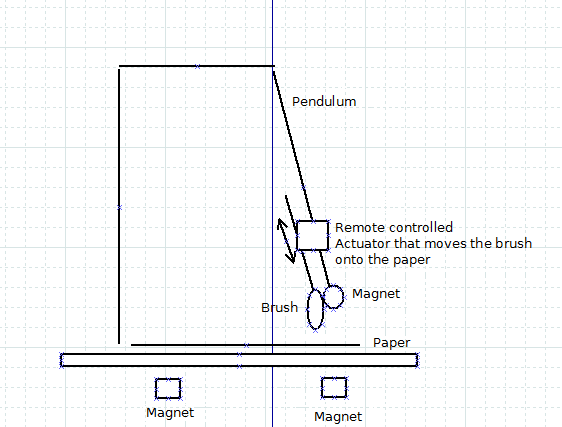 I think the first step should be, to build a magnetic pendulum calligrapher. Note: Something similar has been done before. Here is a more traditional pendulum painting setup: http://gizmodo.com/5503600/the-paint-and-the-pendulum – personally I find the outcomes somewhat boring, since a traditional pendulum makes primarily predictable periodic paths.